If you want the lush look of a weeping willing in an arid climate, this is your tree! This fast-growing, evergreen tree is drought tolerant and requires very little maintenance once established. It also will tolerate a variety of soils, even very poor soils. Acacia stenophylla has an upright form but offers soft, weeping foliage patterns. The columnar growth habit and evergreen foliage make this plant quite unique amongst arid landscape trees. New foliage growth offers a deep maroon color. Leaves mature into a long, slightly twisted form, reaching 16-inches long. In late-winter and early-spring you can expect small, cream-colored, blooms; followed by long seedpods in summer. 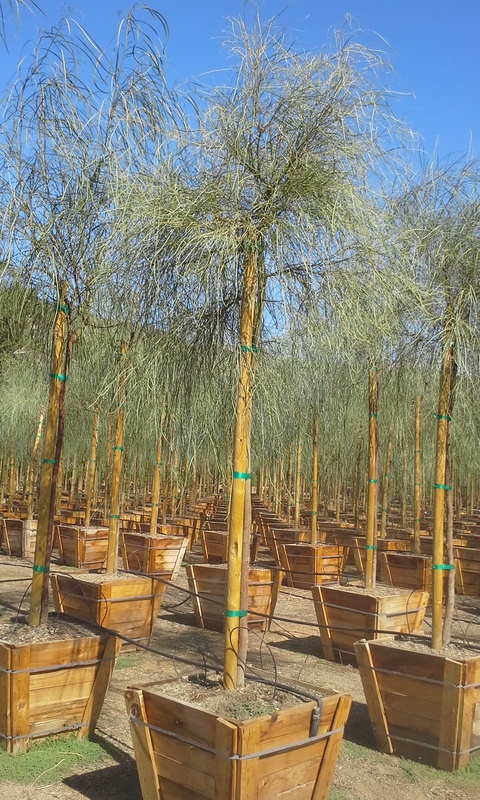 This acacia is perfect for planting in hot, low-water landscapes, where deer and rabbits are present, as plants are resistant to them.